Swiss watch manufacture Ebel, founded in 1911, announced the release of two new products: fashion Ladies Onde and luxurious model X-1, made in a sporty style. Original new items designed specifically for women who appreciate not only the quality but also the excellent design and seeks to highlight its bright individuality. New Onde, their round shapes resembling ripples on calm water, which appears when you throw a pebble into it, is available in two versions – Onde Small and Onde Medium. I watch very elegant and luxurious appearance, despite the lack of superfluous elements. The version Onde Small instead of hours index inserted gems. Case and crown also encrusted with stones. In version Onde Medium mother of pearl dial features Arabic numerals 12 and 8. Both models come with the hours, minutes and seconds and come with steel bracelets. The second new X-1 is a luxury and sporty design combines innovation and modern style. 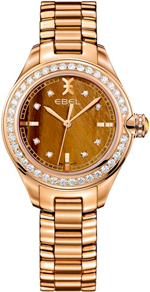 Ebel brand has released three versions of this model: X-1 Large, X-1 and X-Small 1 Chrono. Different versions of the color dials and chronograph counters. Stored characteristic of Ebel feature – links wavy shape, made of stainless steel or ceramic.